Parts of inner city Belfast in Northern Ireland have an enduring legacy of deprivation from 30 years of civil war. Indices on socio-economic aspects of life demonstrate much poorer prospects than other places in the UK and Europe. People are more likely to be in poor health, jobless, and with poor educational achievement. One of most devastating consequences of this is a much higher rate of suicide among inhabitants – particularly for young males and those who were directly impacted by violence. The Public Health Agency asked Perspectivity to facilitate a whole system conversation to try to breakthrough the cycle and develop new working arrangements and programmes that will help those most in need to seek and receive the right help, long before they contemplate suicide. 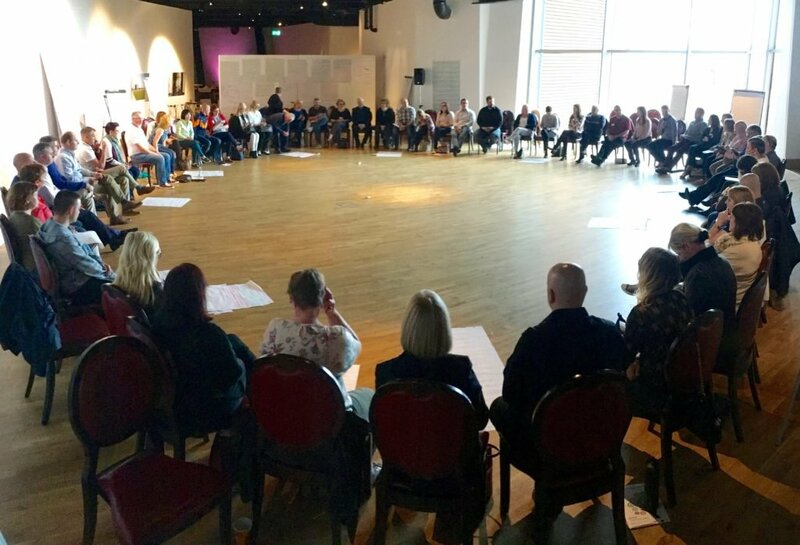 This focus on Suicide Prevention led the Public Health Agency and the Belfast Strategic Partnership to organise a Future Search called ‘Building Hope: Working Together to Prevent Suicide’ and was facilitated by Michael Donnelly from Perspectivity together with Tara Haughian. Representatives from organisations working in education, training and employment. The Future Search took participants through five sessions of dialogue and presentations. They created shared pictures of the past and the present, stated their prouds and sorries about current activities, dreamed up future scenarios, discovered common ground and designed action plans for the future. At the end of the conference the participants agreed on what they would commit to working on the coming years to help reduce deaths by suicide.